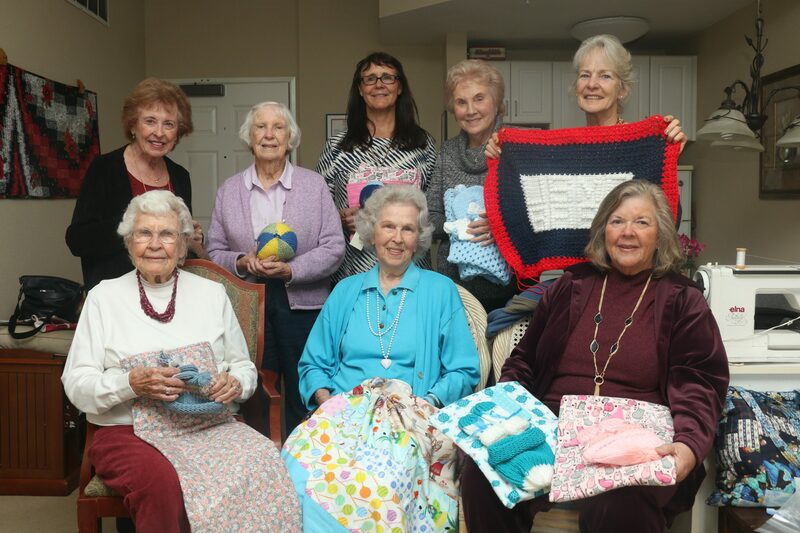 Receiving their name from one of the member’s husbands for their knitting skills and their wit, the San Clemente Knit Wits have donated hundreds of blankets, booties, hats and more to parents at Camp Pendleton that are expecting a child. The Knit Wits began when one of the members of the pool aerobics class at Ole Hanson Beach Club discussed her routine of taking items such as diapers and baby wipes to young couples at Camp Pendleton. “That’s when we got the idea of making baby blankets,” said Margo Grube, a San Clemente resident and one of the original members. The group began with ten women who enjoyed knitting and creating items. Their first blankets were made of cotton, and today they mostly use flannel fabrics to knit and crochet afghans and blankets. They also make hats, and sometimes booties, to go along with the blankets. Often, the group will add a burp cloth that matches the blanket. The set then goes inside one of two gallon-sized Ziploc bags along with a thank you note and a prayer for the new family. But the babies aren’t the only blanket recipients. The group has created knitted caps for Marines, and they sew neck scarves out of camouflage fabric that can be dipped into water to keep their necks cool in hot weather. Now, the group has 13 members, and they meet twice a week at individuals homes. There are also women who contribute blankets and afghans, as well as fabric, but aren’t able to make it to the meetings. During the first meeting of February, the group met at San Clemente Villas inside Grube’s home. Laid out were some of the group’s packages, all set to go to the base, while a couple of the members worked on their pieces. “We have blankets here, yarn balls, booties and little hats,” said Carol Hagdedorn, a Dana Point resident, as she pointed to the bags. Grube said what began as once-a-year trip with maybe 20 or so items has developed into a quarterly trip with 100 items each time. In Margo’s living room, Hagdedorn pointed to Annette Leinen, a member who joined after reading about the group. Her contributions have a special message stitched in the middle. “She tries to make as many as possible read ‘USMC Baby,’” Hagdedorn said of Leinen. In Leinen’s hands was a red, white and blue crocheted blanket with the lettering. “I try to make one for every time,” Leinen said. She added, in total, it takes about 20 hours to make but noted she doesn’t work on the blankets for 20 straight hours. Once the packages are completed, four members head down to the base to give them to the families, Grube said, adding that Hagdedorn takes a photo of the couple with the blanket. Grube said she really enjoys seeing the photos because she can see how the blankets make the parents happy, especially service members that may not have family from around the area. “Some of them are from all over the country,” Grube said. The women will lay out about 20 or 30 of the packages and allow the couples to choose one of the sets. The leftover sets will be saved for the additional classes the base offers. Each member of the group brings a different sense of creativity and specialty. Maureen Wagner, a Capistrano Beach resident, makes hats, and Sam Somerville of San Clemente uses a loom for her items. Hagdedorn said everything is washable, which she knows is important being a mother herself, but overall she’s happy with what the organization can offer. If interested in learning about the group or donating, email Hagdedorn at miles2ph@cox.net or call 949.606.6749.